In 1994, medical during the genocide popularized by the film Hotel Rwanda, roughly one million Rwandans were murdered in a 100-day period. In other words, for 3 ½ months straight, 10,000 people were murdered per day. In a country of only 11 million people. The scars of such a terror last generations—the wounds being inflicted not only on those who perished, but also on those who did the killing, and the children of those on both sides of such a genocidal conflict. Beyond those who were killed or did the killing, there are also, as always, those who fled. In my experience at Casa Marianella, the Rwandan residents we’ve had were always shaped powerfully by the genocide. They all grew up in a multinational way, themselves or their parents having fled to the nearby countries of Burundi or the DRC. They speak not only Kinyarwanda (indigenous to Rwanda) and French, but also Kirundi (Burundi) and Lingala (DRC). In some cases, their families were eventually able to return to Rwanda once conflict had subsided, but others never made it back. 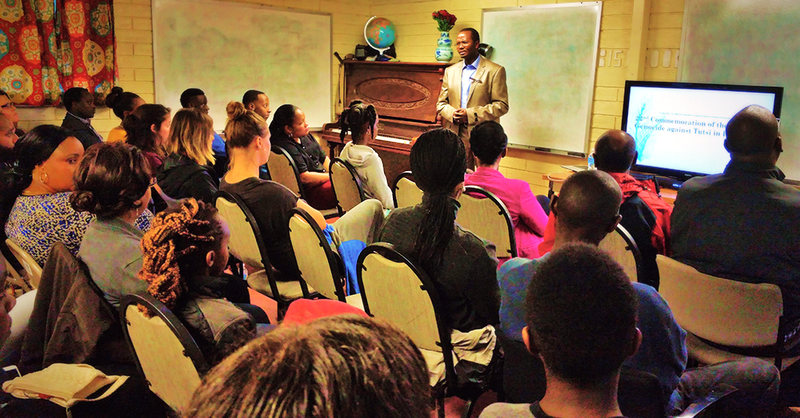 On April 17th of this year, we at Casa memorialized the Rwandan genocide for the 4th year in a row. On a stormy evening, a collection of Casa Staff, resident and ex-residents, and the larger Austin Rwandan community gathered together in our small laundry room to examine the dark history. We watched speeches given by the children of both victims and perpetrators of the genocide. We discussed the colonial history that laid the framework for the genocidal conflict. And we prayed. 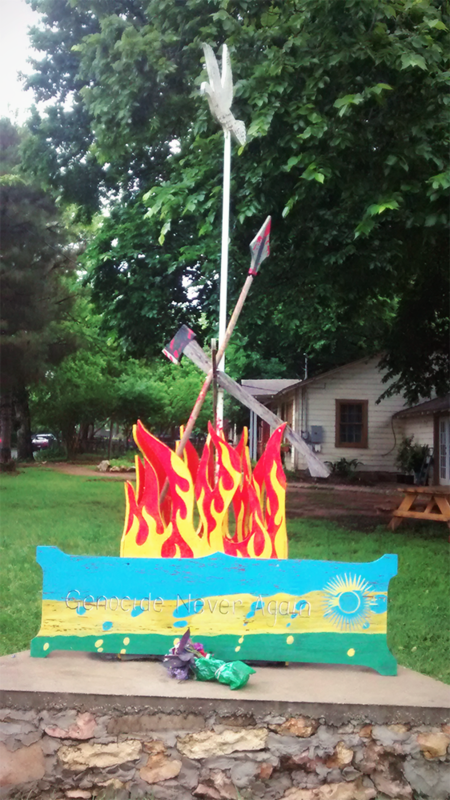 Outside that laundry room, in the far corner of the Casa property, there is an eye-catching memorial. The same Rwandans who organized the presentation this year built this memorial four years ago. It features an ascendant white dove above a bloody spear and axe engulfed in flames. At its bottom a sign reads “Genocide Never Again.” On the whole, it suggests that peace will one day overcome violence. Indeed, conditions have improved considerably in Rwanda. But we at Casa Marianella still receive Rwandan refugees who are fleeing repression and violence in their country. We hope for an end to violence, genocide, and the colonial and imperial forces that engender such phenomena. In the meantime, we offer hospitality, with open ears, open hands, and open hearts. Excellent article;informative and touching. You’re going to be a good journalist Gus!